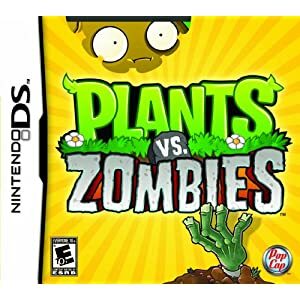 So I was just tooling around Amazon and this came up as recommended for me: Plants Vs. Zombies for the Nintendo DS. I won’t go into how Amazon could possibly know that we’re completely obsessed with the PC-version of the game, but I’m sure we’ll get up getting this for the boys on the DS once it’s out. My only disappointment: that it doesn’t release for the DS until January 2011. Would have loved to have this in time for Christmas. Xbox360 users can get the new game in time and the PC-version is of course already available. I hear there’s an iPhone version but I haven’t checked it out. (Seen it on the iPad though and it’s great there.) Check it Plants Vs. Zombies on Amazon – and be warned: it’s completely mindless, no educational value whatsoever and totally addicting.